After meeting Amy Jordan, we supplied her with five water filters just prior to her hopping a plane to impoverished Ethiopia. While five may not sound like a lot, it was enough to save many lives. My trip was literally life-changing. The people of Arba Minich in Ethiopia were blessed with the filters, which were handed out on the last day there. One filter was presented to the people in the main town where we ministered. Having never seen anything like it, we spent just a few minutes setting the filter up while taking pictures as the entire town celebrated. We then drove to an isolated village to hand out the second water filter. Just one day prior, we had been sharing the love of Jesus Christ to the people of that village, where they listened intently, and many accepted Christ as Lord and Savior. As part of our ministry, we ask the people for prayer requests. In that village, the one request was for safe and clean drinking water so that no one would ever get sick or die again from waterborne disease. At no time had anyone in that village seen running water. Instead of letting the people know that we had a water filter for them, we said we would pray. On the very next day, my teammate returned to the village to deliver the water filter. The people were not just surprised but recognized it as an answer to prayer. The people were so grateful for the filter, and in response to a miracle, even more turned their lives to Jesus. There are no words to express how I felt when seeing hope in their eyes. For all of the help provided and generosity given, I thank you from the bottom of my heart. We have three filters remaining, which will be presented to the pastor we worked with. He will take over in dispersing the filters to people in need. 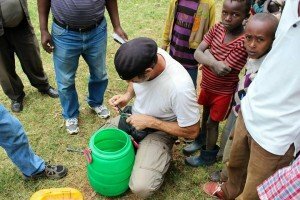 For everyone in Arba Minch and the tiny village, the Water for Life Charity ministry has made a huge difference.